Since 1961, hundreds of men and women from more than a dozen countries have traveled in space. Until the 1980s, however, most of those people came from the United States and the former Soviet Union. 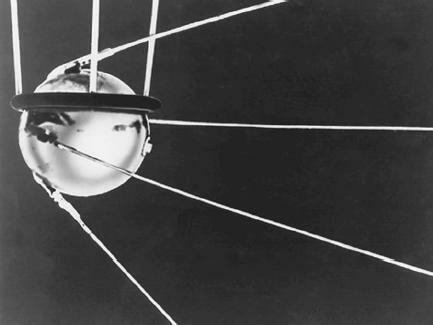 The Soviets were the first to launch an unmanned satellite, Sputnik 1, in 1957. This event marked the beginning of the space race between the United States and the Soviet Union, a campaign for superiority in space exploration. The first living being to travel in space was a dog named Laika. She was sent into space aboard the Soviets' Sputnik 2 in 1957. Laika survived the launch and the first leg of the journey. A week after launch, however, the air supply ran out and Laika suffocated. When the spacecraft reentered Earth's atmosphere in April 1958, it burned up (it had no heat shields) and Laika's body was incinerated. Then on April 12, 1961, Soviet cosmonaut (astronaut) Yury Gagarin rode aboard the Vostok 1, becoming the first human in space. In 108 minutes, he made a single orbit around Earth before reentering its atmosphere. At about two miles (more than three kilometers) above the ground, he parachuted to safety. Only recently did scientists from outside Russia learn that this seemingly flawless mission almost ended in disaster. During its final descent, the spacecraft had spun wildly out of control. piloted Mercury flight, Freedom 7, was launched. It took astronaut Alan Shepard on a 15-minute suborbital flight (only a partial—not complete—orbit of Earth) that went 116 miles (187 kilometers) up and 303 miles (488 kilometers) across the Atlantic Ocean at speeds up to 5,146 miles (8,280 kilometers) per hour. The capsule than parachuted safely into the Atlantic Ocean with Shepard inside. Two months later, another U.S. suborbital flight was launched, this one carrying Virgil "Gus" Grissom. Grissom's flight was similar to Shepard's, except at splashdown his capsule took in water and sank. Grissom was unharmed, but his capsule, the Liberty Bell 7, was not recovered. On February 20, 1962, just over nine months after Gagarin's flight, astronaut John Glenn became the first American to orbit Earth. His spacecraft, Friendship 7, completed three orbits in less than five hours. Lunar program. The Apollo program was created for the purpose of landing American astronauts on the Moon. Engineers designed a craft consisting of three parts: a command module, in which the astronauts would travel; a service module, which contained supplies and equipment; and a lunar module, which would detach to land on the Moon. The Apollo program was not without mishap. During a ground test in 1967, a fire engulfed the cabin of the Apollo 1 spacecraft, killing Gus Grissom, Ed White, and Roger Chaffee. This tragedy prompted a two-year delay in the launch of the first Apollo spacecraft. During this time, more than 1,500 modifications were made to the command module. In December 1968, Apollo 8 became the first manned spacecraft to orbit both Earth and the Moon. 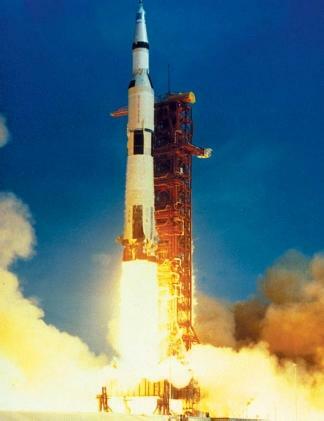 On July 16, 1969, Apollo 11 was launched with astronauts Neil Armstrong, Edwin "Buzz" Aldrin, and Michael Collins on board. Four days later Armstrong and Aldrin landed on the Moon. When Armstrong set foot on lunar soil, he stated, "That's one small step for man, one giant leap for mankind." The Apollo 11 flight to the Moon is considered by many to be the greatest technological achievement of the modern world. Over the next three years, five more Apollo missions landed twelve more Americans on the Moon. Although the United States won the race to the Moon, the Soviet Union achieved other space race "firsts" during the 1960s. The Soviets launched the first three-person spacecraft, Voskhod ("Sunrise"), in October 1964. In March 1965, Soviet cosmonaut Alexei Leonov took the first space walk, spending ten minutes outside the Voskhod capsule connected to the craft only by telephone and telemetry cables (wires used to gather data). The Soviet Union then began work on Soyuz ("Union"). The program proved to be a disaster. In April 1967, Soyuz 1 crashed to Earth with cosmonaut Vladimir Komarov on board. The tragedy halted the Soviet space program for 18 months. By the time they reentered the space flight quest, the Soviets had turned their attention to establishing the first orbiting space station, Salyut ("Salute"). On April 19, 1971, the Soviets launched Salyut 1, which was designed for both civilian and military purposes. The station was powered by two solar panels and divided into several different modules, three of which were pressurized for human life support. The three-person crew of Soyuz 11 successfully entered Salyut 1 on June 7, 1971. The cosmonauts' three-week stay set a new record for human endurance in space. But during their reentry into Earth's atmosphere, a cabin seal released prematurely and the spacecraft lost air pressure. The three crew members had not been issued pressure suits and suffocated instantly. As a result of this disaster, the Soviets could not refuel the station. They were forced to allow it to fall out of its orbit and burn up in reentry. Despite this major setback, the Soviets were eventually able to launch other Salyut stations as the decade progressed. The only comparable U.S. space station has been Skylab. Launched on May 14, 1973, this two-story craft was 118 feet (36 meters) long and 21 feet (6.4 meters) in diameter and weighed nearly 100 tons (110 metric tons). Although Skylab encountered problems immediately after launch, a crew was able to repair the damage. In its six years of operation, Skylab housed three different crews for a total of 171 days. Studies on board the space station greatly increased our knowledge of the Sun and its effect on Earth's environment. In 1979, Skylab fell back to Earth. A more advanced Soviet space station, Mir (which means both "Peace" and "World"), was launched in February 1986. Able to accommodate up to six crew members at a time, Mir was designed to afford greater comfort and privacy to its inhabitants so they would be able to remain on board for longer periods. Although plagued with technical problems in 1997, Mir continued to host Russian cosmonauts and international space travelers (a total of 104 people from 12 countries) who conducted some 23,000 experiments, including research into how humans, animals, and plants function in space. During its lengthy time in orbit, Mir attained a number of accomplishments: longest time in orbit for a space station (15 years), longest time in space for a human (437.7 days), and heaviest artificial object ever to orbit Earth. With a lone cosmonaut on board at the time, it even survived the collapse of the Soviet Union in 1991. During Mir 's lifetime, the Soviet Union and then Russia spent the equivalent of $4.2 billion to build and maintain the station. By 2001, however, the 135-ton (122-metric ton) craft had become too old to maintain properly, and Russia decided to let it fall back to Earth. On March 23, 2001, after having completed 86,330 orbits around the planet, Mir reentered the atmosphere and broke apart. Pieces of the station that did not burn up in the atmosphere splashed harmlessly into stormy waters 1,800 miles (2,896 kilometers) east of New Zealand. living and working space of 46,000 cubic feet (1,300 cubic meters), enough for up to seven astronauts and scientists. The U.S. space shuttle is a winged space plane designed to transport humans into space and back. It is the first and only reusable space vehicle. This 184-foot-long (56-meter-long) vessel acts like a spacecraft, but looks like an airplane. 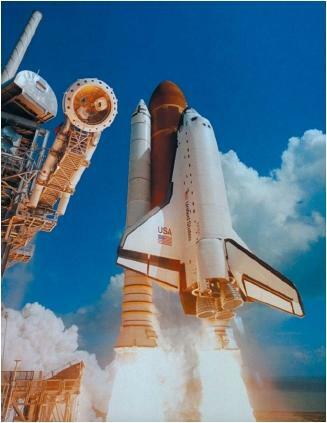 In 1981, the first space shuttle to be launched was Columbia. Challenger, Discovery, and Atlantis rounded out the initial shuttle fleet, which flew 24 consecutive missions. The shuttle program ran smoothly until the Challenger tragedy of January 28, 1986. That shuttle exploded 73 seconds after launch, due to a faulty seal in its solid rocket booster. All seven crew members died as a result. The fleet of shuttles was grounded for 32 months while more than 400 changes in the shuttle's construction were made. The National Aeronautics and Space Administration (NASA) resumed shuttle flights in 1988, having replaced Challenger with Endeavor. Missions of the space shuttles have included the insertion into orbit of the Galileo space probe in 1989 and the Hubble Space Telescope (HST) in 1990. A variety of communications, weather, military, and scientific satellites have also been placed into orbit by crew members aboard space shuttles. The shuttles can be configured to carry many different types of equipment, spacecraft, and scientific experiments. In addition to transporting people, materials, equipment, and spacecraft to orbit, the shuttles allow astronauts to service and repair satellites and observatories in space. In fact, shuttles flew servicing missions to the HST in 1993, 1997, and 1999. At the beginning of the twenty-first century, the mission of many shuttle flights was the continuing construction of the ISS. In December 1998, the crew aboard Endeavor initiated the first assembly sequence of the ISS; they also became the first crew to enter the space station. In October 2000, when Discovery was launched on a mission to continue construction of the ISS, the event marked the one-hundredth flight of a U.S. space shuttle.